What's your next bike gonna be? The FZ-07 isn't going anywhere, but my next bike will hopefully be a 2017 Indian Springfield Dark Horse if they come out with a Dark Horse version of the Indian Springfield. It will probably be an FZ 07 or similar bike. I am coming from a heavy cruiser which I recently sold. I really like the FZ 07. If it had ABS I would probably buy right away. Maybe wait for next year to see if FZ07 adds ABS or if a similar bike comes along. Something else that I wonder is why the passenger seat points towards the sky so much on these bikes. :-) It is not a dirt bike, so why should the tail of the bike have to be so high and angled up? Just wondering. Is there a purpose other than confirming to a specific look for this category of bikes? I'm not sure where you are located but here in UK you can't even buy fz07 (or mt 07 as we call it) 2016 model without abs. It always seemed weird that in the UK you cannot get an -07 without ABS and in the US you cannot get one with it. I would have paid extra for ABS if it was an option. I am still very happy with my bike even though it does not have ABS. I've just said this to someone. But take it this way. You over there know how to drive. We here are using the wrong f+#-#@ lane. We need that ABS. You don't. I've got used to it anyway. The only problem when I go abroad. Don't have abs but I love it . Only reason I am alive today is because of BMW abs. I am probably the best wet weather rider in my last road racing club ( dry... not as good) with the exception of Jack Miller, but when a semi jammed on it breaks in front of me on a NQ highway in the middle of a monsoon downpour I am pretty sure I could not have stopped like the ABS F800R did without the abs. When I bought the MT there was no abs available. Back to topic. I am retired and this will be my last main bike. Won't live long enough for a new bike and can't afford new one unless this one gets wiped out. Have a Huzky TR650 as well and a GS500 project ( doing a upgrade to as if designed in the 2-teens, without the fuel injection as I couldn't afford that sort of upgrade , then maybe comtemporary cafe racer style it). Located in the US. I think the US regulations on ABS are behind European regulations. I think it would be a good feature to have. Mt10 but more likely Kawasaki zx14r. I want a bigger bike that you can drive far with wind protection aka fairings. Both possible, but i'm satisfied with my 07 atm. Turbo charging is nice but isn't a super charger better since it delivers instant power? Don't have abs but I love it . Only reason I am alive today is because of BMW abs. I am probably the best wet weather rider in my last road racing club ( dry... not as good) with the exception of Jack Miller, but when a semi jammed on it breaks in front of me on a NQ highway in the middle of a monsoon downpour I am pretty sure I could not have stopped like the ABS F800R did without the abs. When I bought the MT there was no abs available. Back to topic. I am retired and this will be my last main bike. Won't live long enough for a new bike and can't afford new one unless this one gets wiped out. Have a Huzky TR650 as well and a GS500 project ( doing a upgrade to as if designed in the 2-teens, without the fuel injection as I couldn't afford that sort of upgrade , then maybe comtemporary cafe racer style it). My only experience with ABS was 6 years on a 96 K11RS BMW and it was pretty much horrid!. It activated way too much on dry roads - frost heaves on the brakes caused stopping distances to at least double as the ABS kicked in when it wasn't at all needed and basically turned the brakes off until I let off the brakes. In those 6 years ( and I commuted all year long as long as it wasn't snowing or below 25F or so (sheesh, imagine picking that 630 lb land yacht up with snow under foot) I never had it activate in the rain - once. That said, I'm sure modern ABS systems are far, far better and that one time in the rain might just save me arse. As for a next bike, if I were to get a wild hair, it would be the KTM 1290 SuperDuke GT - Go big or stay home, lol. Well, I didn't buy this bike for the power. it was more for the ease of use and maintenance. It's plenty fast enough for most of my riding. Besides, I still have an Aprilia in the garage, that by today's standards is slow, but still, at speeds where the FZ starts to feel busy and bucking the and ain't no fun, the Futura is still pretty relaxed, has decent wind protection and 50% more HP and torque for those no-downshift power roll-ons.. The downside, its also carrying 25% more weight. With that SD-GT, the Fut would go, but I think the FZ would stay. If my sweetheart doesn't lose interest after the upcoming msf course, it's going to be a Honda cb300f for her. As for me after a 125cc that is my first big bike. And don't get me wrong I love so much that I will keep it even if I get a new one. It's like selling my grandmother. I would never do that. But I need more power. I love, and always have loved, small bikes. Really I am too heavy for the really small ones but I much prefer them. Big bikes bore me. I am a handling junkie and a weight weenie. Give me a ridiculously tight road and a tiny bike and I am happy. Biggest fun ever for me was racing a cr85 powered Honda RS125 framed bike on a wet go kart track. Powersliding with 28HP ( yes, 28 hp out of a 85cc motor) and no weight ( 70kg fuelled). The bike weighed 10kg less than me. The bike I liked the least was the ER6N, my heaviest race bike. Fun, but not in the same league as the littlies with the throttle to the stop the whole time and rowing the gearlever like a fan. Only ever owned on 1000cc bike and I hated it. The very reason I bought the 07 is because it is light(ish) and a twin. Beemer, I agree with you about the early BMW ABS though. Sort of worked in some situations but a pain in others. The new(ish) Bosch one on the F800 and other BMW's and Huskies for a while is brilliant ( would like to turn it off for the dirt and do) and weighs .8 of a kg. It's amazing what you can do when your sensors and ecu can think in nanoseconds instead of milliseconds. i dont see anything on the market i want. i need a big fat hawg for touring w/ my lady, but i don't want the payment. so i just dump money into the fz07. its got all the power i'll ever need. it just needs to be touched up, made to look nice. i did swap bikes with an fz09 owner recently. i gotta admit its a fine motorcycle. i don't like the saddle, but everything else is really nice. Either xsr900 or Ducati Scrambler. Unless for some reason I decide that I need a new sport touring bike, then Hayabusa. I almost bought the xsr900 but if youre under 5'10 youll be on your tip toes. Looking into dual.sports. wr250r maybe. I need to venture out off the roads. I believe its for weight balance when riding 2up on sports bikes. Had never thought of that. I have never owned a sports bike so I am sure there is a lot I dont know. Nothing against the XSR900, but personally I feel trying to fit a retro/classic style onto an FZ09 just didn't fully mesh. 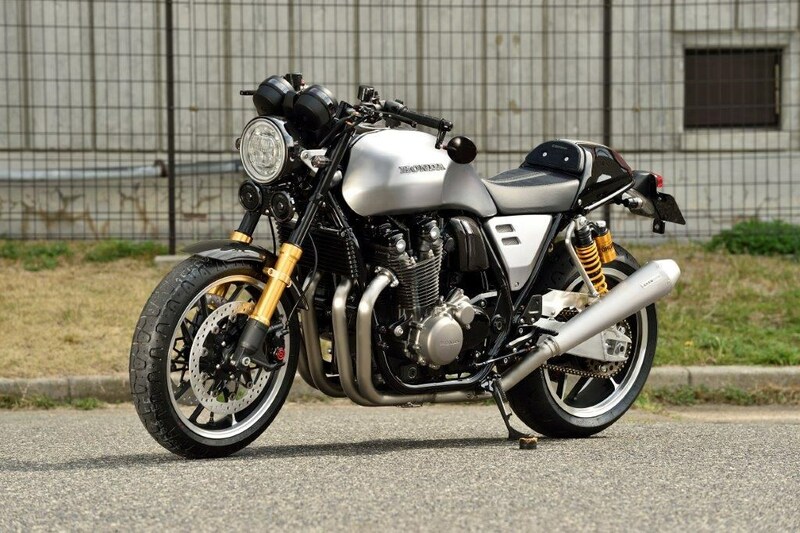 But take a look at that Honda CB1100! That is what the XSR900 should've looked like if they built it from the ground up (but with a triple engine). I will be all over that if it is ever brought into production.